I can’t even begin to express how thankful I am for the opportunity and experiences you gave me. Going to New York Fashion Week was the coolest thing I have ever done. It was an experience I will never forget. Not only were the shows amazing but all the people we met were so kind and lovely. The hotel that we stayed in, the Waldorf, was beautiful and we got to know the bell men who were all very kind to us. There are so many people to thank for making my trip amazing!! First off I would like to thank Tanya Taylor for taking the time and letting us come to your office and talk to you. You are an inspiration and I enjoyed our time with you. Learning about the industry and how you work and how you got started was extremely inspiring. It was also pleasure to meet your family, you were all so admirable and sweet. Also thank you for the beautiful dress I love it! Next I would like to thank Nigel Barker and his wife for meeting with me before your book signing you have been someone I’ve looked up to since I started watching Americas Next Top Model and it was lovely meeting you. I would also like to thank Kate Spade for having me at her presentation, it was really cool and the line was beautiful, and thank you for the purse you sent me (I use it every day). Also thank you to Monique Lhuillier, Mara Hoffman, The Academy of Arts, and Edun for having me at your shows. It was wonderful being able to go backstage to meet you all. Thank you to Brad Goreski for stopping to meet me at the Kate Spade presentation and later sending me a beautiful bouquet of flowers on Valentines Day, it was amazing and it made me tear up, you are amazing. 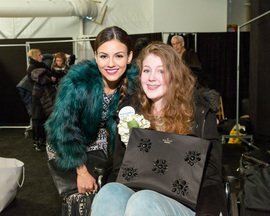 Next I would like to thank the make a wish volunteers that came with us everywhere you were all so kind and it was so nice meeting you. Thank you to all of our drivers, especially Eric, for taking us to and from shows in style. Lastly I would like to thank Cobie Smulders, Brittany Snow, Frankie grande, Chantelle brown, Miss Jay Alexander, Miss Universe, Jennette McCurdy, and Victoria justice for stopping to meet me and take selfies with me. I don’t think this letter can even begin to express my gratitude. I am just so thankful that I had this opportunity and it meant the world to me. Thank you so so so so soooo much! !